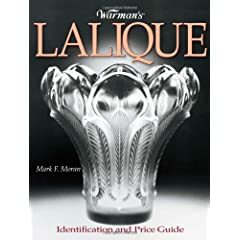 The remarkable work of one of the greatest glass designers and makers is captured in this spectacular volume Warman's Lalique: Identification and Price Guide that illustrates the best of his work. It examines in informative text & full color photographs the brilliant work of René Lalique, an artist of wide-ranging genius, whose scent bottles, vases, bowls, mascots, and statuary number among the most popular collectibles around. René Lalique became synonomous with French Art Nouveau decorative arts. René Lalique was born in 1860 and first began designing fine jewelry in Paris in 1881. Lalique pursued increasingly more innovative experimentation in glass commencing around 1883. Early works used the familiar "lost wax" technique by which the model is made in wax while a mold is formed around the model. Then, the wax is melted and molten glass is poured into the mold. Lalique glass was made in this manner until approximately 1905 at which time the factory was redesigned for a larger production. As such, the individual uniqueness of each example of Lalique glass came to an end with the end of the one-time only molding technique around wax models. The success of this venture resulted in the opening of his own glassworks at Combs-la-Ville in 1909. During the Art Nouveau period, Lalique was well known for a wide variety of objects including perfume bottles, vases, inkwells, decorative boxes, and bookends. Lalique glass is lead based, either mold blown or pressed. Favored motifs during the Art Nouveau period were dancing nymphs, fish, dragonflies, and foliage. Characteristically the glass is crystal in combination with acid-etched relief. Later some items were made in as many as ten colors (red, amber, and green among them) and were occasionally accented with enameling. These colored pieces, especially those in, black, are highly prized by advanced collectors. This book captures them all and makes a great gift for any glass collector or admirer of the best of the Art Nouveau period.